Understanding your pay advice is important. Not only is it important to be familiar with the details contained in your pay advice, it is imperative that you review your information on a regular basis to ensure it is current. For instance, has your address or personal tax situation changed? Have you experienced a life event that may impact your benefit premium deductions? Have you signed up for a voluntary deduction such as United Way? 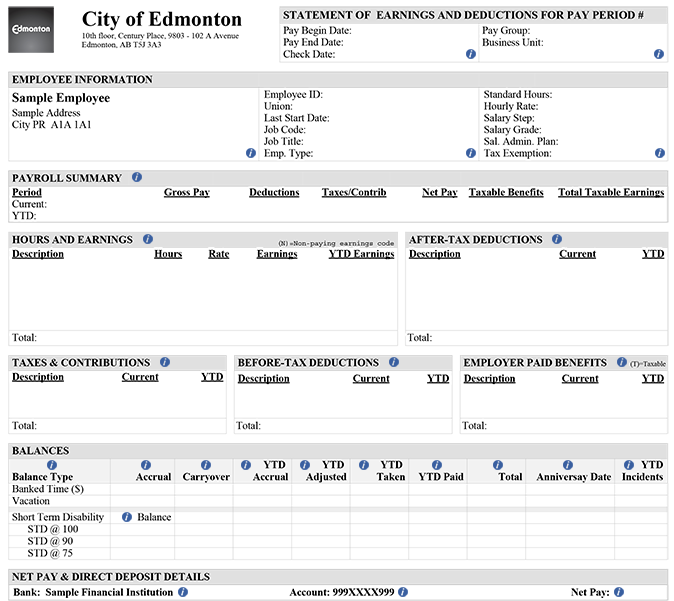 You will see an interactive pay advice image on this page that you can use to help interpret the information contained on a City of Edmonton employee pay advice. The image will walk you through the various information categories contained on your advice. To access descriptions, select the blue "i" icon in the applicable section. Visit https://portal.edmonton.ca (don’t use www.). Login using your Windows username/ID (3+3) and password. Select the Pay Advice tile to view your recent pay advice. View your current pay advice or a previous pay advice using the menu. For more information about your benefit coverage and the premium deduction rates, please refer to Benefits at a Glance. Your name and mailing address currently on file. To change your mailing address, please submit a completed Personal Information Changes form found on onecity/Payroll to the Employee Service Centre.